Every day we get people calling up asking “Do you have a charger holder that will fit my old soda siphon?”. A lot of people pick up soda siphons at estate sales, garage sales,thrift stores or on Ebay; you can find old soda siphons in many places. It is very important that before you purchase a used soda siphon you make sure it comes with a charger holder, if there is no charger holder, don’t waste your time — its often very difficult to find old charger holders. 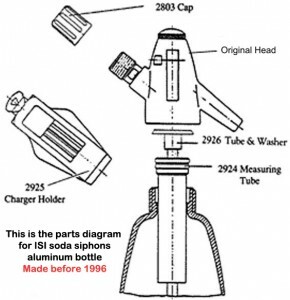 We try very hard to find the right fit to older soda siphons, but the reality is often times the charger holders that will work are unobtainable. The best luck we have had to find older soda siphon parts is to to check on Ebay. Here are a few brands that we do not have charger holders that will fit for. The only soda siphon charger holders that we carry is the new ISI soda siphon charger holder, which is universal with the New* Classic Glass Soda Siphon(Note: Not the *Old classic glass soda siphon, in most cases this charger holder it is much to big.). We also have Mosa charger holders that only fit Mosa soda siphons(also about an inch in diameter). To see if your siphon will fit this charger holder that we carry the first place to start is measuring the metal screw on where you would screw the charger holder. 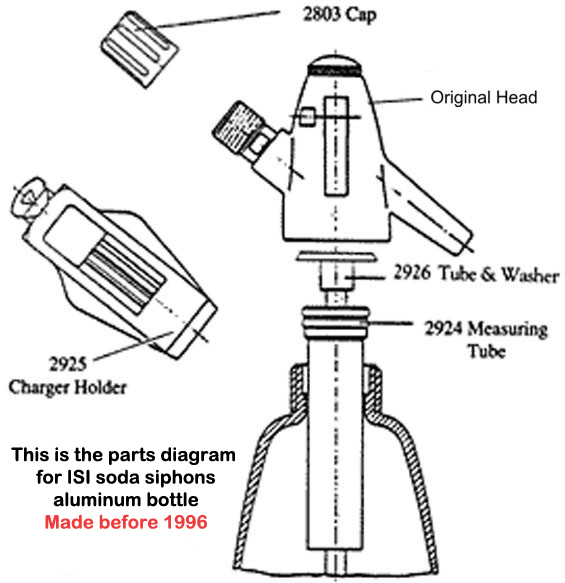 ISI changed their model of there soda siphon in 1996 the soda siphon on the right is the *NEW soda siphon while the soda siphon on the left is the old model. The charger holders are different and the new soda siphon charger holder doesn’t fit onto the old one. The Charger holder on the right is new, where the charger holder on the left(with wings) is old. 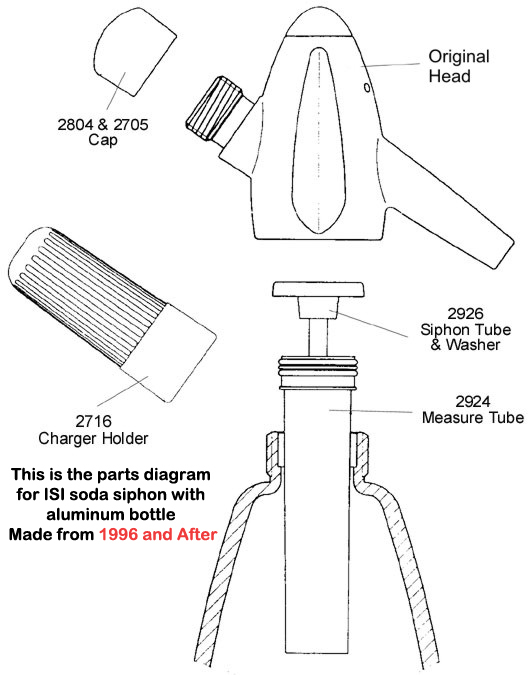 Here is a diagram of the old ISI soda siphon model, and the new ISI soda siphon model. Soda siphons are a great tool to make soda water and an environmentally smarter choice. But its important before you obtain a used siphon you have the parts you need for it to work. If you don’t have a charger holder, your soda siphon will not work. If you have any questions about different soda siphons or what kind of soda siphon you have feel free to leave a comment or shoot us an email! 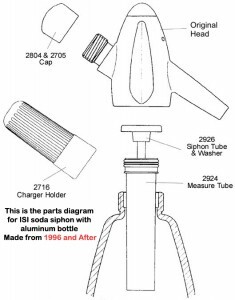 I just received my order of the gasket and straw for my ISI soda siphon mfg. 7/03. It leaks from the head (part 2818 ??). Can I obtain a new head and at what cost? DEAR SIR: WE ORDERED A KIDDE SODA KING FROM EBAY AND THEY DID NOT SEND US THE CHAEGER THAT HOLDS THE CYLINGER FOR FILLING’ WHERE CAN WE FIND ONE? Unfortunately, there isn’t a retailer that we are aware of that sells Kidde charger holders. Usually we recommend finding one on Ebay. Liss charger holders will fit the old BOC/Sparklets seltzers. I have several Hostmasters and Globe Masters. The Liss end will not fit and pull out the plastic sleeve/spacer if it’s inserted into the BOC bottle. I have a Kovocas soda siphon. Is there any chance of getting a replacement head? Where? It’s slim. Kovocas went out of business some time ago, we usually direct people to ebay.co.uk,that is really your best bet. People have had success finding parts/siphons/heads for Kovocas on there. Good luck! just in case somebody stubles across this post and needs a bulb/charge holder for one of those old BOC or Sparklets New York glass soda siphons: We still sell spare parts. We also offer other spare parts or complete repair for the Sparklets Soda Siphon. We at Die Siphon Manufaktur made it our mission to revive the Sparklets New York Soda Siphon. Every model we sell is professionally restored by us; with handcraft precision we make sure that every Siphon works just as well as it did 80 years ago. 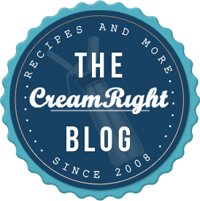 Email custservice@creamright.com this information, as it would be useful for them to know, as we get abundance of phone calls for these siphons. Thanks! 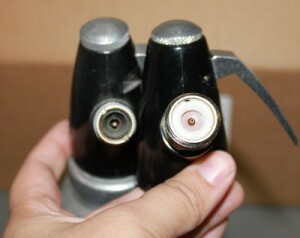 I just bought a retro shouldered ?1970″s BOC Sparklets Siphon. They reference removing the inner sleeve. 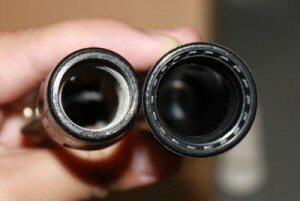 One of the photos I saw showed the cylinder (not shouldered) holder used to remove the plastic sleeve in the siphon. There appears to be another instrument to remove the plastic sleeve that looks like a tweezer with hook like protrusions at the distal end. It is difficult to clean and empty the water with the sleeve in there. Hi! I just bought an old Kovocas Soda Siphon from a second hand store. I have all the pieces, but the CO2 corroded it and it definitely doesn’t work! I’ve been researching all night, because I figured I could just get a completely new top to just screw on the bottle. In my search I have completely confused myself! Does anyone have any leads? I literally would love to just salvage the bottle and get a complete new top (tube and all). My old glass mesh soda siphon was manufactured in Czecoslovakia and there are no identification symbols on the bottom of the bottle. It was purchased back in the 1970’s. Which is obviously the old version. 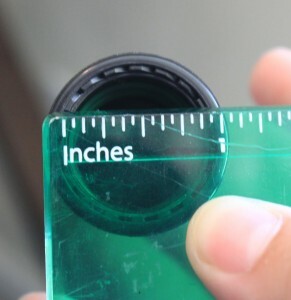 It has a thread diameter of 1.25 ins. Would you have a dispensing head that would fit this bottle? no promises, but if you give us a call we might be able to find one for you. I have sparklet D which needs all the rubber gaskets and seals replaced. Can you help? I have around 500 Soda King Super Chargers. They are around 30 years old. I have recently started to use them and questioned the taste of the soda After being used ,I can shake out some liquid from the cartridge that is black. I have cut a few open and the interior has a dark film coating. Has the CO2 broken down the steel? Should I dispose of them? Yes, we recommend disposing after 5 years. You can give us a call and the warehouse team can check to see if there is anything available for that size. were you able to find a suitable charger holder for the CC glass soda siphon? I am also looking for one and am having trouble. Greetings~ I have a vintage soda siphon that seesm to be in mint condition. Luckily, it came with the charger holder! However it seems the cartridges are slightly smaller than the space for the cartridge holder. Although I can get it in and tighten it down…it seems to have a lot of move space and the holder is longer than the cartridge. This is my first soda siphon is this normal or did vintage siphons hold a different sized cartridge? Hi, i have an ACC Soda Syphon from the 80 s that requires a wing nut to work.Where can i get one? You might try Ebay, but could be a long shot. What is your email address so I may send a few pics of a vintage soda syphon I just received? It was my Grandfather’s and I was hoping someone could help me identify it. Thank you so much, in advance, for any help you can provide. I really want to purchase a soda syphone and have found a few on ebay. They are glass with metalmesh, they say working order but I’m confused as in the comments above it says I’ll need a charger holder. I can send a picture of the one i was going to buy and maybe you could advise me. I am looking for spare parts for my Sparklets Soda Syphon. I am missing the Puncture Pin and I need the rubber seal also. Just wondering if you know where I can get them. I am after the pierce pin rubber, anyone knows where can I get this part ?? Hi, I have an old glass bottle with mesh. It needs the charger holder. How do I determine which type to buy. 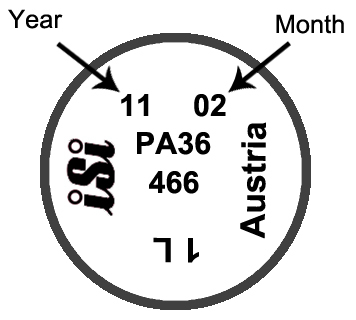 I can’t seem to find anywhere that explains the distinction between iSi and BOC. I have a Growlerwerks uKeg pressurized growler. Their web site states Whip-it brand is compatible.The 8 gram co2 cartridge has to be between 63.5 to 66 mm overall length, 17.5 to 18.5 outside diameter, with the neck 7.5 to 8.9 outside diameter and length of 7.5 to 5.0 mm. In addition it must be “food grade’, use an unthreaded connection port and have protective coating for use in damp environments. Which of your brands should I order? I made the mistake of buying an ISI bottle on ebay without the cartridge holder. Has anyone found an equivalent for the 2925 winged holder? Also – if the isi cartridges are 10 years old I should toss? Hi Elsa, you might want to try Ebay for the same charger holder. Technically chargers never expire. My dad gave me his old 1970’s vintage syphon .. it’s one of those with the metal mesh all around it. (Unused for at least 25-30 years) I cleaned it out, filled it up and gassed it as normal . When I went to use it, nothing happened.. no water, no sound, nothing. Any ideas on what the problem could be ?? Is it safe to slowly open it and check the seals ? I understand that I cannot use a new charger holder on an old Liss glass siphon, but can I replace the whole head assembly? Then I could use the new charger holder. I have a BOC soda syphon that appears to be intact other than no instructions. All the videos and PDF instruction sheets I’ve found online refer to a “key” that is used to remove the filling tube. This has what appears to be a neoprene tube about 3 inches in length. However, if I play with it, it tends to fall down into the bottle rather than come out through the neck. In fact, the neck has no shelf or ledge for the tube to sit on. 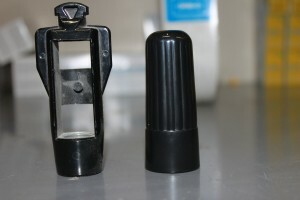 Did BOC ever make bottles that the filling tube was NOT intended to be removed? Thanks in advance.